Join us for the 30th Annual Tex Mex 5k Race for Open Space - Volunteers are a big part of the Tex Mex 5k experience! 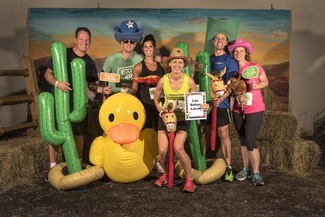 As a way of saying THANK YOU for your help, volunteers are invited to join the fun at the Party-Under-the-Stars complete with a 5k Dinner, one of Tex Mex's famous Margaritas (or craft draft beer). PLUS you will receive a $10 gift certificate to Tex Mex Connection - good anytime except for the night of the race! Volunteers must show a valid photo ID. Volunteers are needed for a variety of days and hours - see what suits your schedule the best. You may sign-up for more than one time slot. Distribute runners' numbers & shirts. Distribute runners' numbers & shirts- help set-up and breakdown area. If you can help but not till after 4 please comment as to your arrival time. Keep the parking lot looking good! Must be able to carry 20+ pound bag of trash.